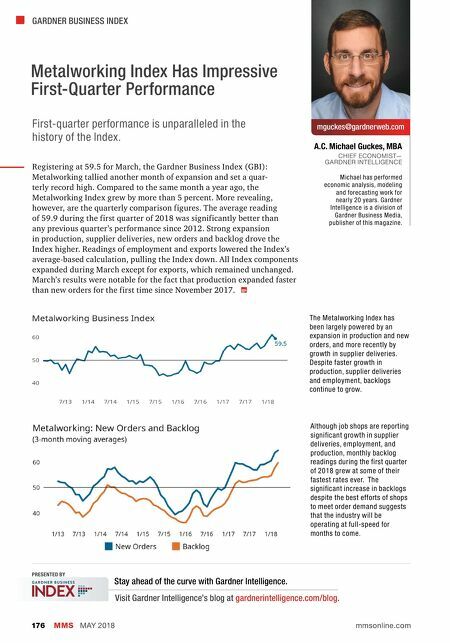 GARDNER BUSINESS INDEX MMS MAY 2018 176 mmsonline.com A.C. Michael Guckes, MBA CHIEF ECONOMIST— GARDNER INTELLIGENCE mguckes@gardnerweb.com Metalworking Index Has Impressive First-Quarter Performance First-quarter performance is unparalleled in the history of the Index. Michael has performed economic analysis, modeling and forecasting work for nearly 20 years. Gardner Intelligence is a division of Gardner Business Media, publisher of this magazine. Registering at 59.5 for March, the Gardner Business Index (GBI): Metalworking tallied another month of expansion and set a quar- terly record high. 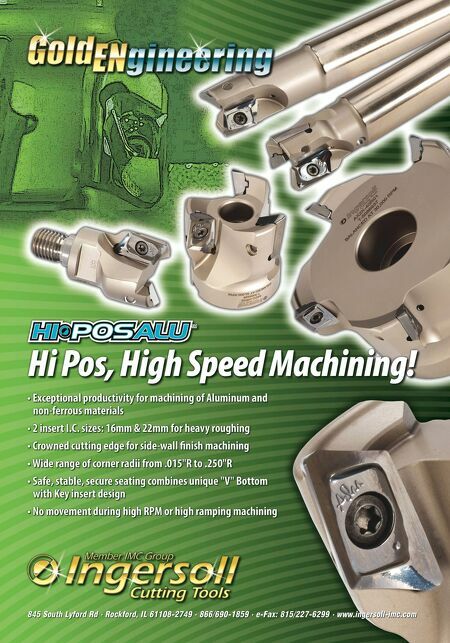 Compared to the same month a year ago, the Metalworking Index grew by more than 5 percent. More revealing, however, are the quarterly comparison figures. The average reading of 59.9 during the first quarter of 2018 was significantly better than any previous quarter's performance since 2012. Strong expansion in production, supplier deliveries, new orders and backlog drove the Index higher. Readings of employment and exports lowered the Index's average-based calculation, pulling the Index down. All Index components expanded during March except for exports, which remained unchanged. March's results were notable for the fact that production expanded faster than new orders for the first time since November 2017. The Metalworking Index has been largely powered by an expansion in production and new orders, and more recently by growth in supplier deliveries. Despite faster growth in production, supplier deliveries and employment, backlogs continue to grow. Although job shops are reporting significant growth in supplier deliveries, employment, and production, monthly backlog readings during the first quarter of 2018 grew at some of their fastest rates ever. The significant increase in backlogs despite the best efforts of shops to meet order demand suggests that the industry will be operating at full-speed for months to come. PRESENTED BY Stay ahead of the curve with Gardner Intelligence. Visit Gardner Intelligence's blog at gardnerintelligence.com/blog .